For anyone considering camp hosting at Hilgard Junction, I have one word for you: Don't. The park is a perfectly lovely park. However it is located right at the junction of I-84 and Highway 244 in Eastern Oregon. Eastbound traffic on I-84 comes down a steep hill here and the trucks use their jake brakes night and day. While the park is fine for an overnight stay for most folks, living next to the freeway for a month is not my idea of a great camping experience. 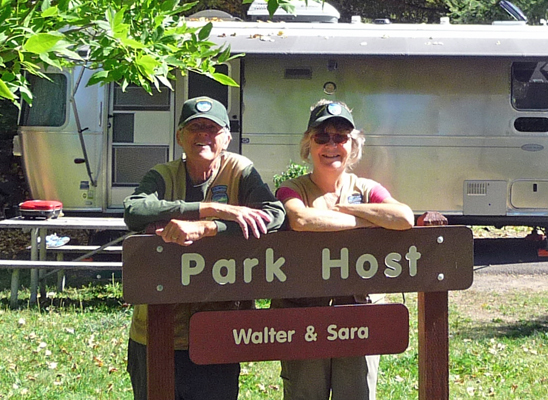 In addition, the small campground (18 sites) gets very little use so there is little call for you to use any hosting skills you may have. In September we were averaging 4 sets of campers a night with a max of 8 on Labor day weekend and a low of 1, one weeknight. People rarely stay more than one night and they arrive mostly in the early evening and leave first thing in the morning. The bulk of our hosting duties consisted of driving around in the evening and writing down license plate numbers (mostly out of state) and checking to be sure that there was toilet paper in the bathrooms. Questions were rare. Once the burn ban was lifted there were few rules to be concerned with. 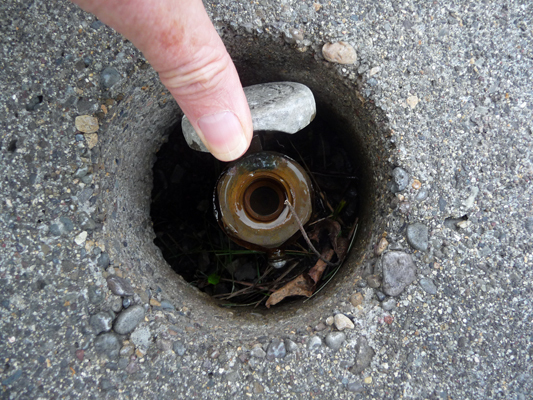 People left very little trash so policing the sites after they left took no time at all. The rest of our volunteer hours were spent picking up pine cones and raking leaves and needles. 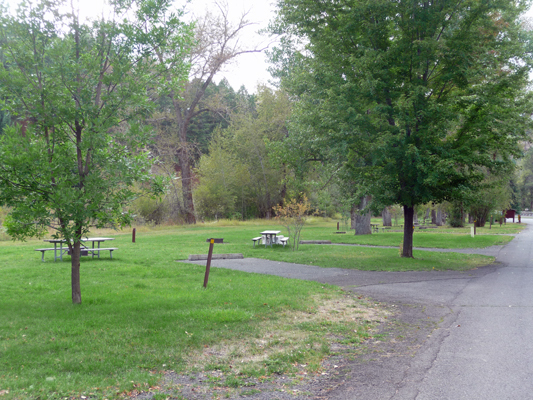 The campground was developed in the 1950's as far was we can tell (long before I-84 was constructed right next door). 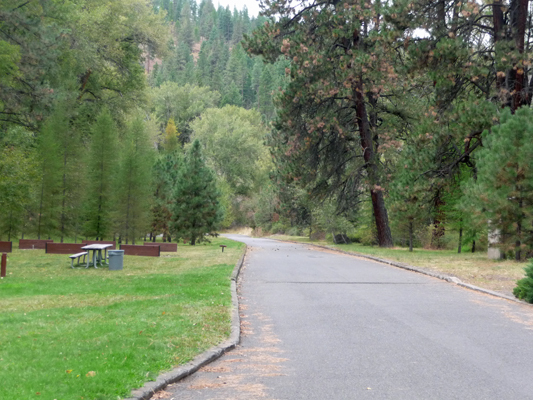 It is a long narrow park running along the shores of the Grande Ronde River. Our guess is that it is about 1/2 mile from the end of the campground to the end of the Day Use area across the highway. 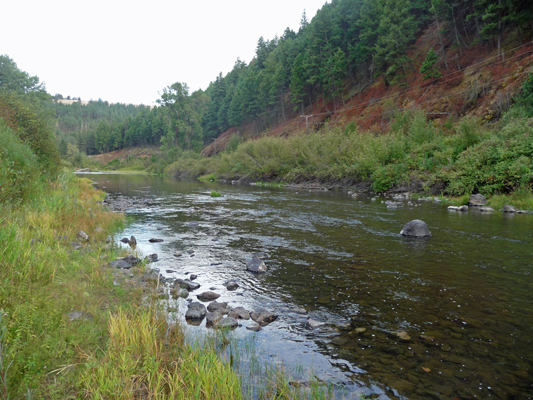 Most of the campsites abut the riparian area next to the river. Some of them have a view of the river and access to the water. There are no reservations here so all sites are first come first served. The sites are all paved though some of the paving has been heaved up by tree roots over the years. The spots are not long but with some creative parking folks have gotten good-sized 5th wheels and large RV's into some of the spots. The grass provides a nice area for tenters. All the sites have nice wood picnic tables and a fire pit with a grill. There are no electrical hook ups (aside from the host site that has full hook ups) but there's a water spigot about every other site in the grassy area. The sites at the far end of the campground were the most popular both because they are a little longer and because they are quieter since I-84 is a bit further away. The bathrooms have flush toilets and sinks with running water. There are no showers. The Day Use Area across the highway also has a bathroom with flush toilets and sinks. 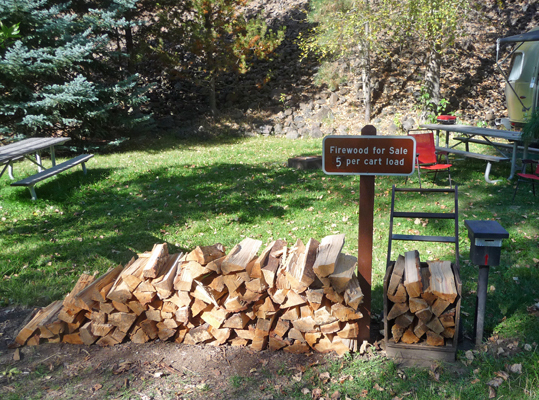 When there isn't a burn ban (there was a ban from mid-August to mid-September 2015), there is firewood for sale next to the host site. 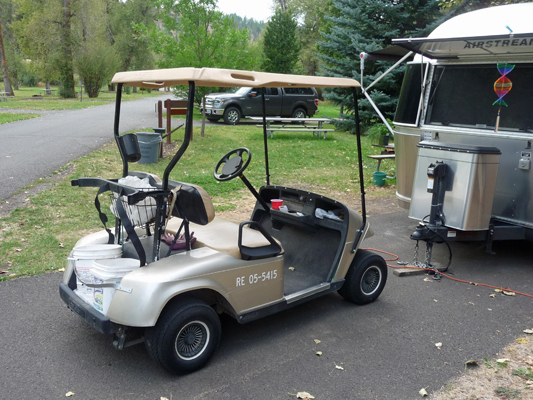 The host's job is to provide change if needed and to keep the little wood cart full for the next camper. The cart is a bit rickety but it does allow the camper to fairly easily get the wood to their campsite. We didn't sell a lot of wood in the 2 weeks the burn ban was lifted but folks were grateful to be able to get it when they wanted it. 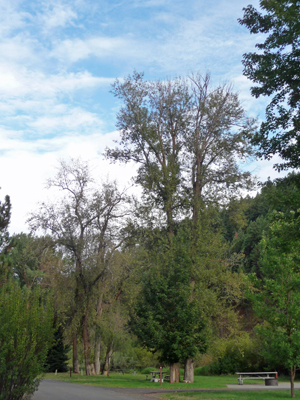 The park has lots of cottonwoods that provide shade (and falling leaves in September). Most of the campers are people in transit who come and stay one night. They are mostly out of state and on their way to somewhere else. We had a couple of folks stay a few days over Labor Day weekend and a couple of locals who spent a few days escaping life in town one week. 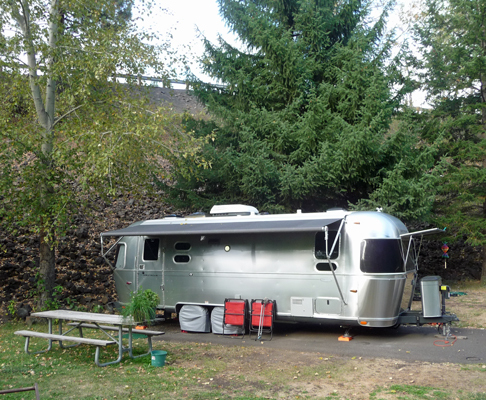 Hilgard Junction State Park is what they call a satellite park. It is one of 4 in the region along with Catherine Creek (outside of Union), Red Bridge (just 8 miles west on Hwy 244) and Ukiah-Dale (47 miles west at the junction of Hwys 244 and 395). As such, it shares a ranger with the other satellites and only has a ranger assistant who also takes care of Red Bridge (and does relief at Catherine Creek 2 days a week). We were told they were under-staffed and that certainly was our experience. The ranger assistants dashed in and out of the park to clean the bathrooms, pick up the trash (no dumpsters here just 55 gallon trash cans that need to be dumped) and collect the fees from the registration and firewood tubes. The host site is next to the bathroom on the side away from the river. The view out our back window (where our main living area is) was of the rocky embankment that is topped by Hwy 244 as it joins I-84. Since the site is rather short they have closed off the site next door to provide you with a place to park your vehicle. They provide a nice golf cart for getting around, though it could use a bigger cargo area (which they told us had been ordered). As far as I was concerned the cart was the best part about this assignment. It's fun to drive and makes life much easier when doing grounds keeping tasks (though transporting hoses with it was a bit of a challenge). 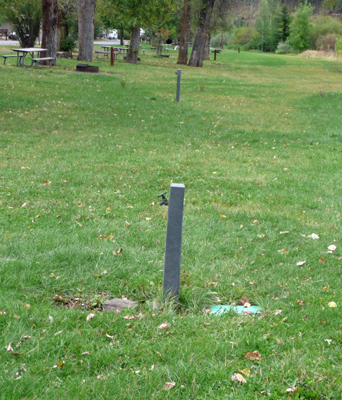 Aside from the 18 site campground there are two Day Use Areas in the park. One is adjoining the campground--in fact you drive through it to get to the campground. There was a constant stream of people coming into the Day Use Area and driving into the campground area to use the restroom since there isn't a restroom in that section of the Day Use. A few folks from town came to use the picnic area and play in the river. But very few folks stopped to visit the Oregon Trail Interpretive Kiosk on the far side of the parking area. It does have a pay phone, though it didn't have a dial tone when we checked it. Maybe you get that when you put 50 cents in. The displays in the kiosk are nice but we've seen the same ones at other rest areas and interpretive centers in Eastern Oregon. 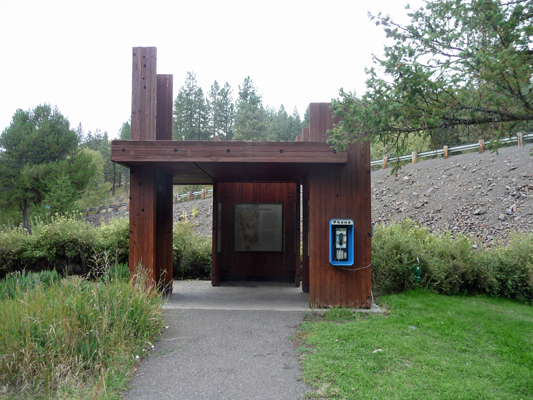 On the west side of Hwy 244 there is another large Day Use Area with its own restroom. 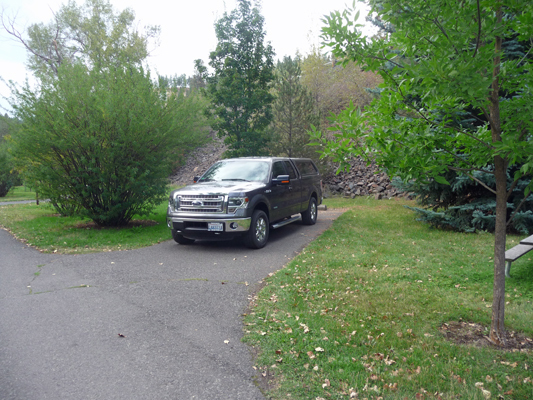 It too gets a steady stream of folks parking to have lunch at the picnic tables and to use the rest room. Folks will also park here for the day and car pool to hunt further up Hwy 244. We had lots of hunters leave their trash here each weekend because the Forest Service provides no trash service at the campgrounds up Hwy 244. While it isn't actually legal to leave trash here, they simply ask folks not to stuff their big bags into the trash cans because they don't want the trash to end up in the woods. 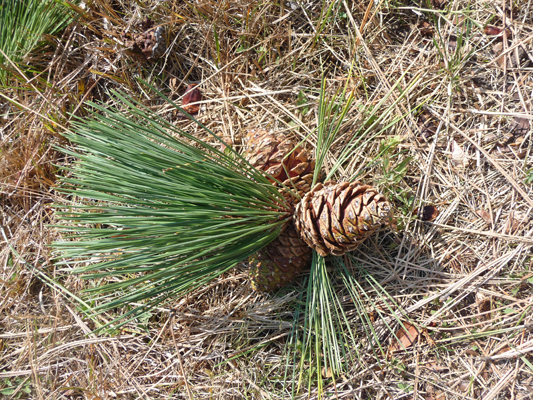 We spent a great deal of time picking up pine cones and raking needles from the Ponderosa Pines here. We tried to keep the road and parking area clear of cones on a daily basis and raked the needles once a week to keep at least at some level of tidiness. The campground had leaves but they didn't make as much of a mess as the needles did. This Day Use Area has a turn around where you can park and easily get down to the river. 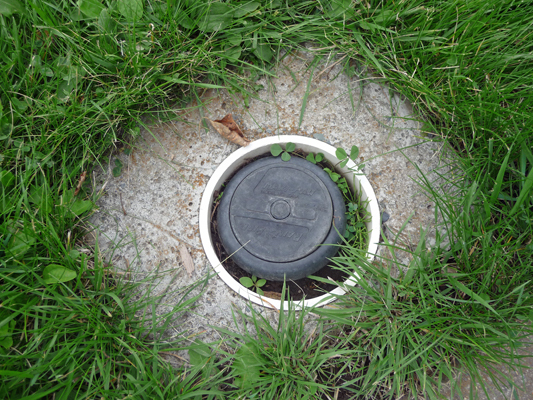 There are also horse shoe pits which we never saw used. People fished fairly regulary by the highway bridge. In September the river was pretty shallow (less than knee deep) but it deepens here at the bridge and people did catch trout. 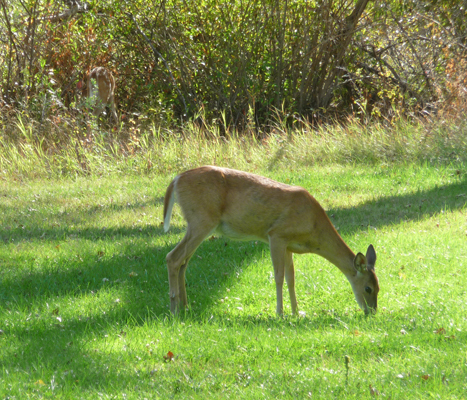 There were two families of deer who came at dusk to feed on the grass each evening--one at the far end of the campground and one in the Day Use Area (we saw them on both sides of the road across the month). 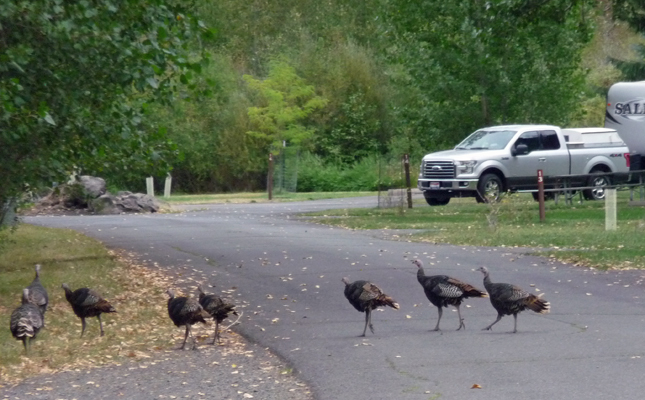 There was also a flock of 9 wild turkeys who passed through regularly. Host duties include assisting with irrigation most months. There's a lot of grass to water and the well produces 100 gallons a minute (or so the well log says). 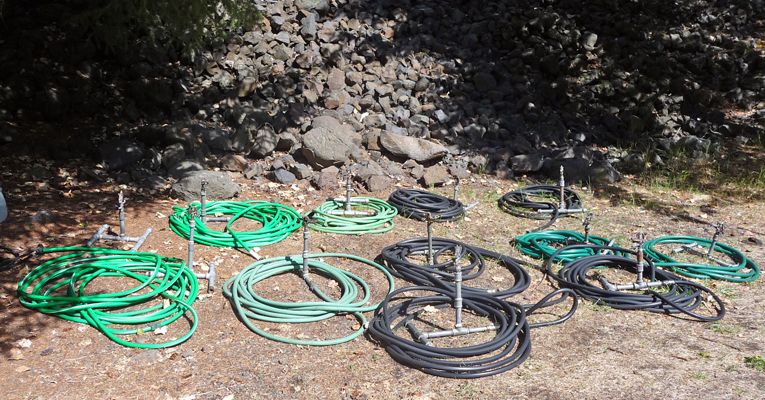 There are 12 hoses with Rainbirds to use in the campground. Both Day Use Areas have plug in sprinklers (some actually plug in while some screw in). 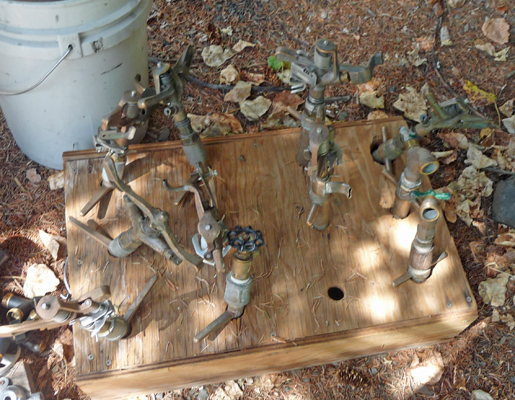 I found these to be very challenging both to find in the grass, to figure out which kind of head they needed and then to get them installed without getting soaked. One morning most of them wouldn't work when you plugged them in but they worked later in the day--too cold? 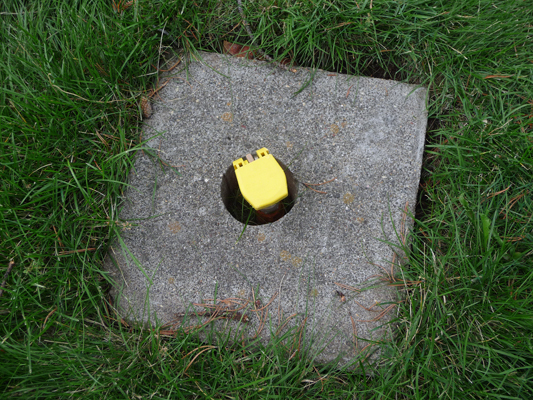 The plug ins go into a fixture with a concrete surround in the lawn. 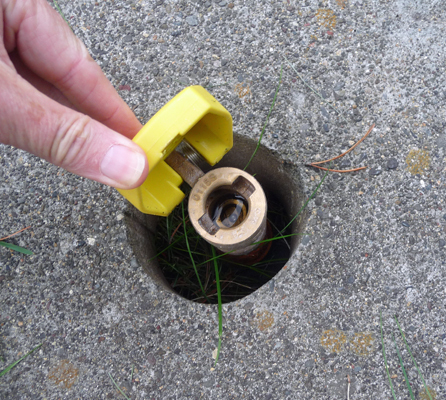 You lift the cap and by examining the opening you can tell if it needs a plug in or a screw in. The Day Use Areas also need hoses and Rainbirds to cover areas that these lovely plug ins don't cover and there are faucets that plug in (and screw in) so you can use them. The Day Use Area across the highway has 3 zones of built in Rainbirds that can be turned on with a valve which is great. The sprinkler heads are hidden under black covers which pop up when you turn on the water. The huge production of the well along with problems with the size of the pipes and another unknown problem meant that the well would cycle when you had fewer than 12 sprinklers going which is a major no-no for wells. So it was quite a challenge to get everything set up and running to minimize the cycling and then to try to optimize the pressure in the system by adding enough sprinklers but not too many. I hit the wall emotionally the second day we fought with the system. I had trouble with the plug ins not working, I got soaked and the well shut off. I ended up frustrated and exhausted. It turns out that hosts are really only supposed to be responsible for 3 sprinklers while the ranger assistant does the rest. Ha! The Ranger Assistant doesn't have the time to do that with all running around they have to do. I threw enough of a stink that they agreed that they didn't need to water in September and certainly not until the problems with the well were fixed. But be forewarned if you take on a hosting job here in the summer, watering can be a huge job! If you don't mind traffic noise and are looking for a low key position with most of your time devoted to grounds keeping (though in the summer there is irrigation to assist with) then this might be an okay deal for you. However we were frankly bored. The area doesn't provide much hiking unless you drive quite a ways to hike in the Eagle Cap Wilderness east of La Grande. The local hikes are all interpretive trails with little to commend them. And aside from the Oregon Trail Interpretive sites there's really not much the area has to offer. 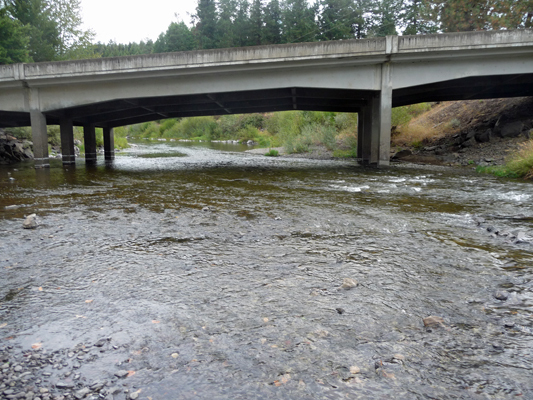 However if you like to fish, folks were catching trout in the Grande Ronde River here in the park near the highway bridge. And many bow hunters stopped to use the Day Use Area and talked of their success hunting (and we saw elk racks on trucks the last weekend). La Grande does have a great Laundromat and both a Safeway and Wal-Mart for shopping. The public library provides free Wi-Fi as does Bubbles, the Laundromat. Our Sprint (Virgin Mobile) phones didn't work at the campground but they worked fine in La Grande. Our Verizon (Straight Talk) hot spot worked at the campground though it was not fast. Occasionally it would get bogged down entirely--probably when someone was using their Smart phone in the Day Use area. There was no 'over the air' TV at the campground but you might be able to get satellite here, I don't know--there are a lot of trees and the big embankment. We visited all the other campgrounds in this region and decided that Red Bridge was probably the best of the lot. Hwy 244 has very little traffic and the host site is set away from the road. It has 10 walk in campsites and 10 long regular sites (can handle bigger rigs than Hilgard Junction but also don't have full hook ups). 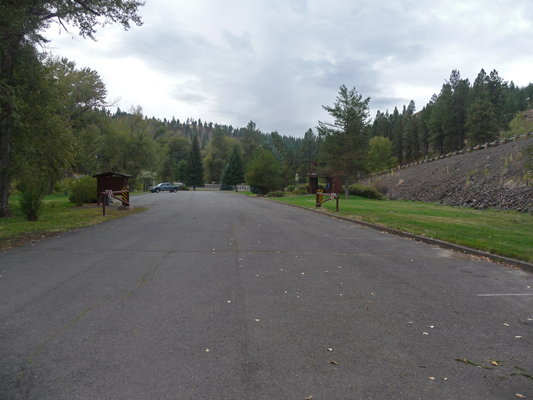 Emigrant Springs has hook up sites and is much busier but it's RIGHT next to the freeway and is very noisy. The sites are very close together too. We camped there 10 plus years ago for one night and said never again.